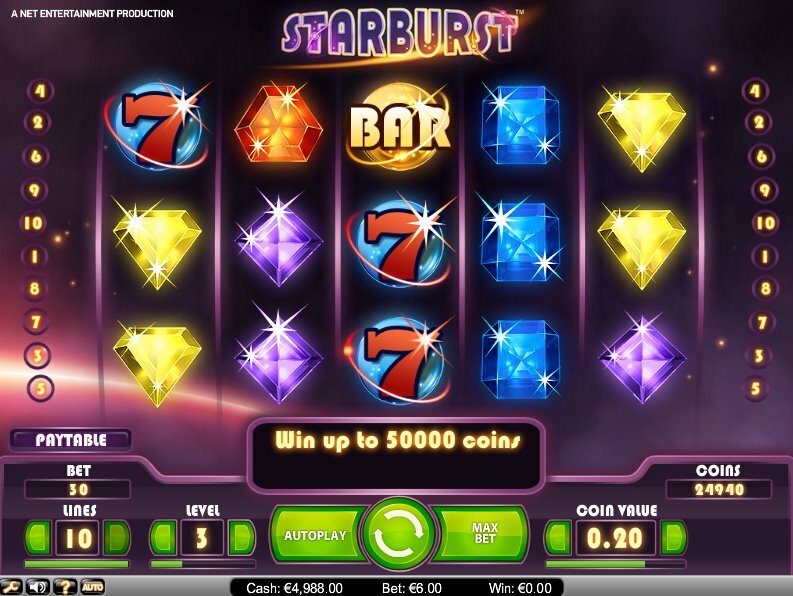 This jewel-obsessed slot from online slot developer NetEnt has been racking up the winners since its release, and has enough rubies, emeralds and diamonds to make you go cross-eyed. 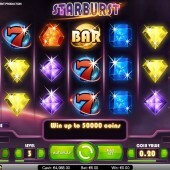 Starburst is a 5-reel, 10-payline game with a 50,000-coin jackpot. Aesthetically, Starburst looks like the opening sequence to a '70s variety show: a black background spangled with stars, and the reels filled with gems. Lots of gems. Here we get emeralds, rubies, diamonds, plus - oddly - classic 'Bar' and red '7' symbols. The game's sweetest feature is an expanding Wild, in this case the Starburst symbol, which appears on Reels 2, 3 and 4. As well as expanding to fill the entire reel and replacing other symbols, it also awards a re-spin each time it appears. There's a maximum number of re-spins of five, so potentially there could be some decent payouts. There's a place for simple slots, and Starburst definitely falls into that category. It won't attract anyone who's idea of a simple slot is Thunderstruck 2, but then not everyone wants multiple levels of sophistication. For me, Starburst is a little boring. Surely slots developers can make things simple AND addictive? Video game makers have been doing it for years, after all. But hey, thousands of online casino fans can't be wrong, can they? If you're a fan of NetEnt's more involved slots, such as their lavish film tie-in slot, Scarface, will probably be surprised by the level of complexity here. However, if you're after something simple, and are on a magic tip, you might also like to check out NetEnt’s Bejeweled-style slot, Elements: The Awakening.